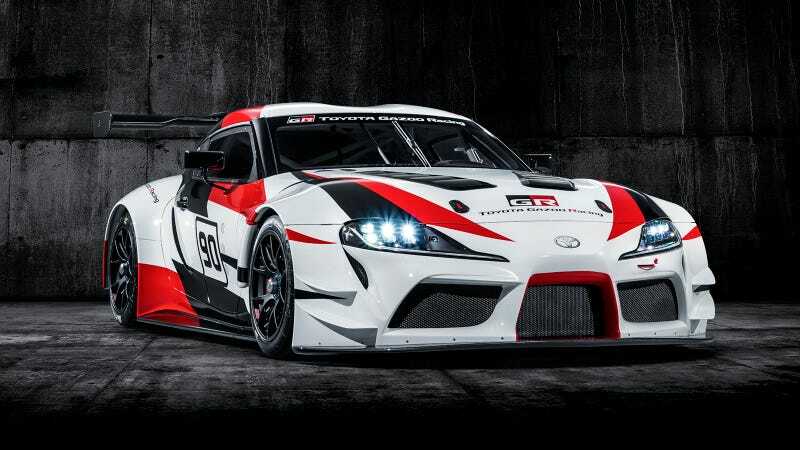 Meet the new Toyota GR Supra Racing Concept, the race-concept version of what the production Toyota Supra will be. No, it’s not the production version, but it’s our closest official look yet of what’s to come. The new Toyota Supra mule has been running around long enough that it deserves its own mid-cycle refresh, but that’s neither here nor there. This Concept here is front-engined, rear-driven and made with lightweight materials. The windshield and windows are made of plastic. The chassis has lowered front and rear suspension with OEM parts, BBS center-lock racing wheels, Michelin track tires and Brembo Racing calipers. And there’s a racing exhaust. What does that mean? It’s anyone’s guess! No other details were shared. There was no confirmation of whether it would share the same platform as the upcoming, BMW Z4 Roadster, nor what kind of gearbox it would have. Or engine. Regardless, this is the first time that Toyota has publicly confirmed that it’s building the new Supra. When that happens, it will have some large shoes to fill. Is all that love for the Supra warranted? That’s up to you personally to decide, but there’s no denying the car’s street cred. It is the tuners’ dream car, with the legendary 2JZ engine that could be easily tuned to put out 800 HP, easy. The racing concept doesn’t look that far off! I’m slightly disappointed today not to see the production version, but at least the thing has been confirmed. Based on what the Concept looks like, I think we’re in pretty good hands.